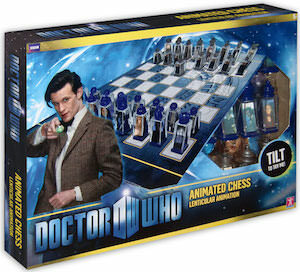 If you like chess and Doctor Who then you are in luck because now there is this Doctor Who chess set. Just like normal there is a board with chess pieces but these pieces are a little bit different. It’s almost like character from the Doctor Who TV series are stuck in the pieces. Yes they even move. The board comes with 32 chess pieces and there are the good guys witch include the 11th Doctor, Amy Pond, River Song, Rory and the Tardis. And then there are the bad guys with include Weeping Angels, Dalek, Cybermen and more. Now your rainy night becomes way more interesting while playing a game with this Doctor Who Animated Chess Set.